Information technology-based alliances are rapidly spreading in organizations, which calls upon researchers to develop an adequate theoretical lens to examine this phenomenon and its key associated outcomes, such as the business performance of alliance firms. However, strategic alliances are mostly examined from a transaction cost economics perspective, and the results on performance are inconclusive at best. This paper proposes an alternative lens - the resource-based view - and applies an extended version of it to explain the performance of firms in IT-based alliances. A conceptual model is developed that examines the impact of shared information technology resources on firm performance. Also, a measurement scale for these resources is developed and preliminarily validated. Addas, Shamel, & Pinsonneault, Alain. (2007). 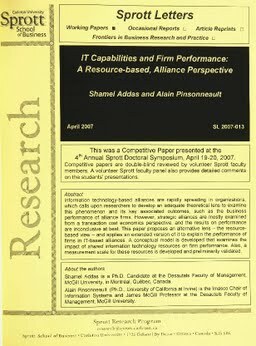 IT Capabilities and Firm Performance: A Resource-based, Alliance Perspective. Sprott Letters, April(2007).